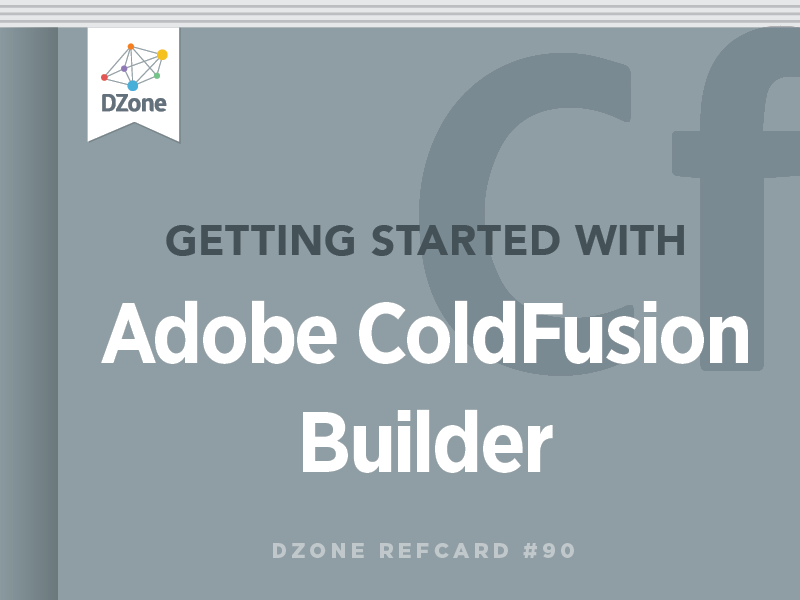 Learn to install the Eclipse-based Adobe ColdFusion Builder IDE and build a ColdFusion project while reviewing the IDE's features. ColdFusion Builder is Adobe's new IDE designed to deliver truly rapid application development using its ColdFusion server product. It is the first IDE dedicated specifically to ColdFusion since Macromedia turned out its last release of ColdFusion Studio back in 2001. ColdFusion Builder is based on Eclipse, and not the previous tool. Therefore it works easily with Adobe® Flash® Builder™ and other Eclipse plugins. ColdFusion Builder is an Eclipse plugin, and like Flash Builder can be installed in one of two methods: standalone and plugin. Which one you chose will depend on whether you are already using Eclipse and whether it makes sense for you to include ColdFusion Builder in your workflow. Standalone creates a packaged version of ColdFusion Builder, which includes Eclipse. It will be labeled “ColdFusion Builder” and have icons and splash screens that reflect this. However, most of these differences are cosmetic only. It's still Eclipse, and this version of it is fully capable, so you can use other Eclipse plugins in this install. The plugin version requires you to have Eclipse already setup on your machine. It installs itself as a plugin into that copy. So all of your screens will still say Eclipse, and ColdFusion will just be another perspective. This can be any version of Eclipse you have pulled down from eclipse.org, or a packaged Eclipse install like Flash Builder. The basic collection of code in ColdFusion Builder is a project. Many developers setup one ColdFusion Builder project per ColdFusion application. However, they are not required to a one to one match. Some people make the root of their project the root of their Web server, and have all of the applications under one giant project. This Refcard will show how to do a 1 app to 1 project match. Opening up a new installed version of Coldfusion Builder should show you something similar to figure 1. To start experimenting with ColdFusion Builder we will need a ColdFusion file, called a “template”. We could also use a ColdFusion Component to show some things off. You now have files to test. You can experiment with these if you like. To get the full use out of ColdFusion Builder we need to configure it to communicate directly with our ColdFusion server. ColdFusion Builder wants to know about the servers that you develop on. By having that information it can allow you to manage the servers through the IDE, get extra logging information and browse datasources and file systems on the server. It also allows ColdFusion Builder to provide "code insight" which means that the IDE knows about the components, methods and variables that you are currently working with. It's recommended that you do your development against a locally installed version of ColdFusion on the same workstation as ColdFusion Builder. We're going to assume you have a default install of ColdFusion running the ColdFusion Web Server. If you are using your own Web server like Apache or IIS your settings may vary. ColdFusion Builder now knows about your server. We just need to tell “SampleProject” to use that server. If not open, open index.cfm Type hello world in the editor window Choose File -> Save to save the file Locate the Source tab at the bottom of the editor Next to Source you should see tabs labeled “Safari”, “IE”,“Firefox” depending on what you have installed. Choose the browser of your choice “Hello World” should appear in bold. ColdFusion Builder's tooling is divided into several forms called views. The Navigator is a basic view that comes with Eclipse. It allows you to see and organize your projects and files. One of the overlooked featured of this view is the concept of “Working Sets”. They allow you to group various projects together and then selectively show or hide groups. This is very effective when you have tens of projects split amongst many clients. This can allow you to only see your current projects without having to go through the trouble of archiving and removing projects that you aren't working on but could pick up at any moment. The File view allows you to navigate the file system of your workstation independent of any projects you may have setup. This is useful if you need to quickly open a file from a project before you started using ColdFusion Builder and Projects. One of the other things the file view can do is connect to FTP/ SFTP servers. This means that you can review remote files, and edit code on them. When you start your ColdFusion server via the Servers view, the Console output for the server is printed here. This can be very useful for seeing errors occur in real time. Also content that is written to the main application log for your server will show up here. So you can use CFLog to make content appear in the Console. Tail View allows you to see the contents of a file updated in real time. This is very useful for targeting the error log of your ColdFusion server. However it's important to note that you are not limited to ColdFusion logs. Any text file on your system can be seen this way, like your Web server logs, or mail logs. The Service Browser shows you all CFCs that are installed under a ColdFusion server's webroot. It allows you to inspect all of the methods, see arguments, and filter for access. It also allows you to paste code calling these CFCs and methods into your code window. Look at index.cfm in editor window; a cfinvoke tag should now be in the code. This view allows you to install, review information about, refresh, and delete ColdFusion Builder Extensions. These will be discussed separately. Outline presents organized version of your highlighting major structures in your code. You can use the outline to click through to those structures in your code. It is configurable, sortable and filterable, so you can choose what shows up in the outline. A great use of this is when you inherit a project where the functions in CFCs aren't alphabetized. You can easily go to the Outline view, filter for functions, and then sort alphabetically. RDS stands for Remote Development Services in the ColdFusion world. It allows developers to access key pieces of information about a remote server. It has be be setup as part of your ColdFusion server install. Be aware that it is perfectly reasonable to have installed on your local install of ColdFusion, but it is discouraged on public facing or shared hosting machines due to the large amount of information it makes available. RDS Data view allows you to see and interact with datasources that you've setup on your ColdFusion server. It allows you to see tables, views, columns, and column definitions. Using context menus from this view you can activate the RDS Query Viewer. This view is an interactive query window that allows you to test SQL SELECT statements against your datasources. Note that it only allows SELECT, you can not use it to alter data in the datasource. This allows you to browse the file system on your ColdFusion server. This is obviously much more useful for remote server then for your local system. Snippets allow you to create brief bits of reusable code, organize them, and pull them into your code. You can even create shortcuts that you can use to pull snippets into your source code using shortcut keys. You should now have a snippet named “Quick Date” in your Snippet View. However we can do that even faster. Delete that quick date in index.cfm. Code Assist refers to ColdFusion Builder knowledge about the CFML and CFScript languages. When you are typing out ColdFusion language constructs, it can prompt you with attributes speeding up your coding. Open and delete any code in index.cfm. You'll have subject=“” with your cursor between the quotation marks. In addition to code hinting for CFScript and CFML, ColdFusion Builder can do this for HTML, JS, and CSS. While code assist is about knowing what the language is capable of, Code Insight is about knowing what the code you are writing is doing. This will allow you to make references to scopes, variables, and components that you have written, and get drop down lists of variables, and methods in those structures. Type Sam; the drop down list should now only have SampleProject.utility(). Those dropdown lists for both component and methods were the Code Insight feature in action. Refactoring encompasses a lot of things. In ColdFusion Builder this feature was installed with only one of those things, method renaming. This allows you to rename a method, and have references to that method also be renamed, without having to manually find and replace those references. ColdFusion Extensions allow you to extend ColdFusion Builders features and functionality with ColdFusion. Using some XML to wire ColdFusion Builder views to backend ColdFusion code, you can make the IDE do anything ColdFusion can do. Extensions are packaged as zip files. You manage the install of them through the Extensions view. ColdFusion Builder extensions can be used in a variety of ways. They can generate code. They can analyze code. There's even one that will translate content in your editor window from one written language to another, using the Google Translation API. In short they can do anything ColdFusion can do. The Adobe CFC Generator is a basic code generator. These files have all of the code to wire up a remote Web service to manipulate the Artists table from a ColdFusion AJAX or Flex front end for your applications. The largest concentration of extensions currently resides at RIAForge.com. By February 2010 there were close to 30 Extensions for ColdFusion Builder, which was in beta. It's expected that many of the major frameworks will release extensions to go along with their tools. By default, ColdFusion Builder (and Eclipse) does not have line numbering enabled. ColdFusion Builder has a default set of color coding and shortcut keys. If you've migrated to ColdFusion Builder from Dreamweaver or CFEclispe you may not like the current configuration. If so, you can easily change this by alerting your profile. You can also create your own profiles if you wish. Any IDE worth its salt is capable of color code. The main feature here is tweaking the color settings. Tweak colors on Keywords and what not. However, these settings are not enough for many programmers so you are better off editing the colorization file directly. This will export a .col file. Select the edited .col file. ColdFusion Builder wants to know about the servers that you develop on. By having that information it can allow you to manage the servers through the IDE, get extra logging information and browse datasources and file systems on the server. It also allows ColdFusion Builder to provide \"code insight\" which means that the IDE knows about the components, methods and variables that you are currently working with.